Hema was performing at the Pravasi Bhartiya Divas in Varanasi. 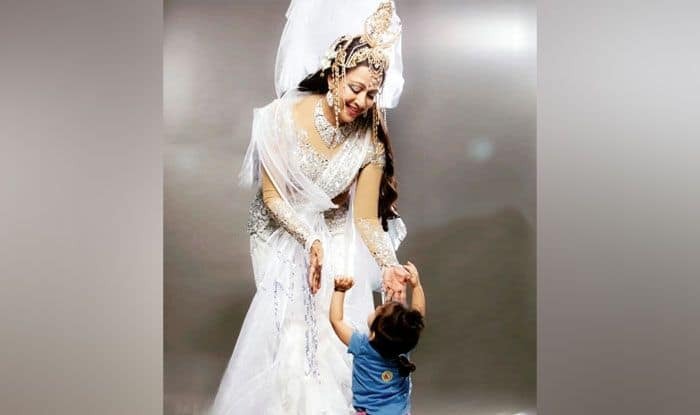 Veteran actor and BJP MP Hema Malini, who recently performed at the Pravasi Bhartiya Divas in Varanasi and earned a lot of praise for her role as Mother Ganga, was snapped looking dreamy in a picture with her grandchild. The picture, which was taken during a photoshoot for the launch of her dance ballet Ganga, was shared by her daughter Esha Deol. The Dream Girl star had herself tweeted out pictures of her look as Mother Ganga from the show, which was about the history of India’s holiest river and how it is getting polluted. A video of her performance was also shared online by news agency ANI, for which she has received a lot of praise. The 15th Pravasi Bhartiya Divas was held during January 21-23, 2019 in Varanasi, and Prime Minister Narendra Modi had inaugurated the event and delivered the keynote address. The event is held to mark the contribution of the overseas Indian community towards the development of India.